How do I make a reservation to use the range? Lane reservations are a benefit that we provide to our range members only and require 24hrs advance notice. Limit of 2 lanes per reservation. All other rentals are first come, first served. If you would like to become a range member, please speak with any member of our staff for an application. All individuals under the age of 18 must have adult supervision at all times and may not use their own shooting stall. No person(s) under the age of eight (8) years old are permitted on the firing line at any time. Yes, full auto is allowed. In fact, we have full auto rentals available at the range rental office. You may collect your brass that is within your stall back to the wall. You may NOT collect brass from the left or right of your lane or from in front of the firing line. Do I have to buy ammo at the range or can I bring my own? You may bring your own ammo to use in your personal guns; however, rental guns do require that you purchase ammunition from us. For ammunition restrictions, please review our Range Rules section. Yes, you may shoot your reloads in your own firearm(s); however, we do NOT allow reloads to be fired from any of the rental firearms. Though reloads are allowed, we do NOT allow proof loads. Can I shoot lead, hollow point and FMJ bullets on the range? Yes, you can shoot any standard type of bullet on the range. For ammunition restrictions, please review our Range Rules section. 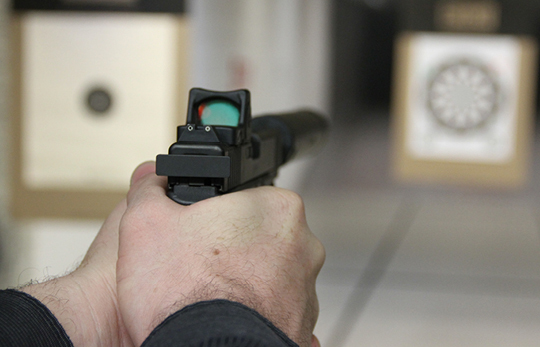 Do you offer classes, competitions and/or special programs at the range? Yes, we offer a wide range of classes in both shooting and non-shooting areas. Visit our Training page for more information. We may also hold range events or host shooting leagues. Check back often or follow us on Facebook to stay-up-to-date on upcoming events. Do minors need to complete the range waiver? Yes, minors need to complete the range waiver and they need to be accompanied by an adult. Once 18, they will need to fill it out and will then be issued their own Range Safety Card.